In a wide-ranging interview with the Austrian daily Wiener Zeitung on April 8th in the run-up to Easter, the cardinal said the fact that women were ordained deacons in the West up to the Middle Ages should give the Latin-rite Church food for thought. “The big theological question is, of course, what sort of ordination this was and what consequences one can draw from this today,” said the cardinal, a noted theologian and member of the Order of Preachers (Dominicans). He noted that while the Eastern Church had always been “much more open” to the difference between what is a sacrament and what is only a sacramental sign, Latin-rite teaching on ordination had since been far more precisely defined. The 72-year-old cardinal said he had no doubts that more women should have leading positions in the Church, adding that not nearly all the options had been explored for that to happen. But regarding women deacons, he voiced a more cautious note. “First let us wait and see what the Vatican commission concludes,” he said. In early August last year, Pope Francis set up a 12-member commission to study the issue of women deacons, especially in the first centuries of the Church’s history. Six members of the still-ongoing commission are women. They include American professor Phyllis Zagano, considered the leading scholar on the question. In his recent interview, Cardinal Schönborn was asked what he told committed women who felt discriminated against in a Church where only men were ordained. “I admit that this does sometimes seem strange,” he replied. “I can understand the malaise which women feel when they see only men concelebrate. I can understand that we must look like a men’s squad up at the altar,” he said. 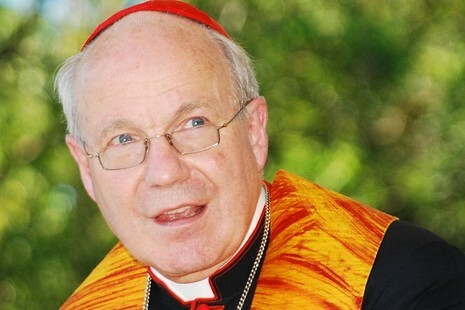 Schönborn, who got his red hat in 1998, is the second-highest ranking cardinal among those who still head a diocese or Vatican office. A close friend and former student of Joseph Ratzinger (Benedict XVI), he has emerged as a key ally of Pope Francis. This is especially true within the Synod of Bishops, where he’s helped the pope develop a renewed pastoral approach towards people who fall short of Church teaching on marriage. In fact, Francis tapped the Austrian cardinal to be the main presenter of his post-synodal exhortation, Amoris Laetitia, when it was released last year to the press in the Holy See’s press hall. The papal document has aroused debate over its nuanced approach towards divorced and remarried Catholics. When Wiener Zeitung asked the cardinal if he would give communion to remarried divorcees, he said he would never refuse anyone communion. However, he warned against oversimplifying the discussion. Cardinal Schönborn said the first question in his mind was not whether remarried divorcees could receive the Eucharist but how they have coped with their situation. He said that includes how they have treated their children, for example, whether they had used them as hostages during the divorce proceedings. How divorcees have treated their former spouses also comes into play, he said. “The question of communion comes right at the end and includes the Sacrament of Reconciliation, something which is often forgotten,” he said. “The real question is whether the couple concerned just want the Church to confirm that everything is fine or whether are they genuinely seeking help for their new lives,” he insisted. In a second (50-minute) interview on April 9th on Austrian state television’s “Guest of the Week”, the cardinal was asked whether Pope Francis was thinking of retiring since early in his pontificate he had mentioned that he hoped to remain “four to five years”. A visibly surprised Schönborn shook his head several times. “Francis is in no way thinking of retiring. He is full of energy,” the cardinal insisted. “My impression is that he wants to complete his plans for church renewal and reform,” he added. The cardinal did confirm that the pope was facing opposition from within the Church but recalled that there have always been people who resist change. “Approval of the pope’s approach and, above all, the convincing way in which he performs his office, is enormous,” the cardinal emphasized.